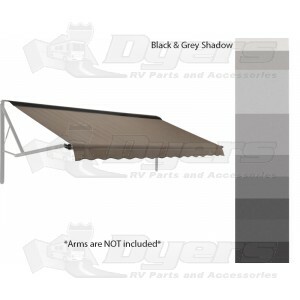 Dometic 12' power awning with Black & Gray Shadow acrylic fabric and Wind Sensor Technology. Designed to out-think the elements, the WeatherPro is the cool-looking awning you've always wanted - with the ease and convenience of self-operation by remote control. The Wind Sensor's "smart technology" automatically closes the awning when it detects potentially dangerous wind conditions. With just the touch of a button, from either the handy remote control or the switch mounted inside the coach, the WeatherPro ectends and tensions the fabric. Another touch and it stows away, securely locked for travel. Dometic has been manufacturing high-quality awnings for many years and provides a full range of durable patio, window and door awnings. Dometic products come in a variety of durable and stylish fabrics, each with its own characteristics. This is the complete 12' roller tube assembly with Black & Gray Shadow double sided acrylic fabric. To determine the size of your current awning you will need to measure from middle of the left arm to middle of the right arm (do not measure the fabric).